If you have never seen Crafty Chick 101 then you must check it out now! Michele, owner of Crafty Chick 101, has a new passion that she is so excited to share with you all-vial necklaces! Sending you things like luck, love and magic is her specialty now. This is not just a one stop shop though. Michele has also created bangle bracelets, earrings and other necklace designs as well. Crafty Chick 101 is now selling designs in specialty boutiques as well as department stores, but you all are lucky as you can just click the link and get to Michele's Etsy store from the comfort of your own home. Filled with dried lavender and yarrow, two flowers known to attract and keep love, this vial pendant is approx. 1 1/4" tall with cork. It comes to you with a 22" silver ball chain and packaged in a white drawstring bag. I could see this being a great gift for your special Valentine! Sure we are right in the middle of winter, but that doesn't stop a girl from dreaming of a day on the beach! This vial would certainly help to keep the dream from fading into the sunset. Filled with beautiful tan sand and orange starfish motif on the label this pendant will be a perfect accessory now as well as once the summer fun rolls around. I mentioned that Crafty Chick 101 has many different accessories and this is another example of Michele's work. 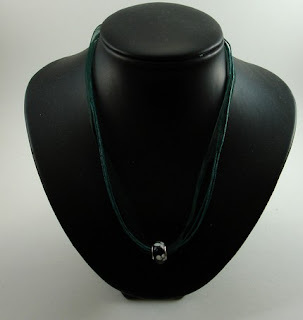 The dark teal green ribbon has a sterling silver core bead hanging from it for an overall length of 17"-19". 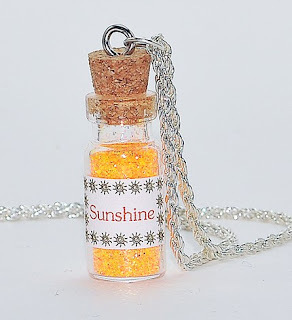 Filled with yellow and orange glitter, this vial is certain to brighten your day! 1. Check out Crafty Chick 101 and come back here. Tell us what your favorite item in the shop is. See! I told you it was easy. Enter before midnight Friday and check back this Saturday to see if you are our winner! *Contest open to US residents only. We have another surprise for you all this week! Michele wanted to extend a special promotion to the readers of Joy De Vivre. She is offering a 10% discount off of your order (before shipping). All you have to do is enter the phrase "blog giveaway" in the message to the seller at checkout and wait for a revised invoice that reflects the discount. If you have any questions or need any custom designs contact Michele and she would be so happy to help you out. my favorite is the beach vial- because I grew up around beaches and miss it so. I also really like her threaded bangles and earrings! oh my god, the sunshine vial! the one you are giving away--it is my favorite! i live in a very cold and blustery place and i hate the winter. i use a sun lamp every day but it's never enough--i miss, and NEED, some sunshine! I like all of your bangle bracelets. enter me! my fav is "Teal Adjustable Ribbon Necklace with Black and White Floral Bead"
I really like the Chocolate Brown Adjustable Ribbon Necklace with Orange and White Swirl Bead. Very elegant. I like the Shades of Sea-Foam Knit Bracelet with Clasp. I love the Cranberry and Beige set of 3 Bangle Bracelets! I follow (follower name is Damla) and I like the Blood - Vial Pendant Necklace. I love the teal,grey and purple bangle bracelets. I love the Set of 10 Mix and Match Bangles ... but the Sunshine vial is my favorite...we could use some sun in Ohio! I like the Recycled Magazine Bangle Bracelets - Set of 3 in Safari Print. I like the A Little Bit of Magic - Vial Necklace. I love all the vials, especially the beach and the sunshine. Who wouldn't love bottled sunshine? My favorite is the magic vial. It makes me think of a magical potion! My favorite is Lucky Pot of Gold Vial Necklace. I also like the thread pendants. I like the twilight vial pendant necklace. Thanks for the giveaway. I like the sunshine vial! Great shop! For this southern girl, the "Snow" vial is tempting, but my favorite is "Beach". I love the yellow knit bracelet! 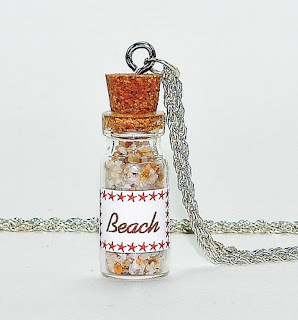 I love the Beach - Vial Pendant Necklace it is a memory of home. 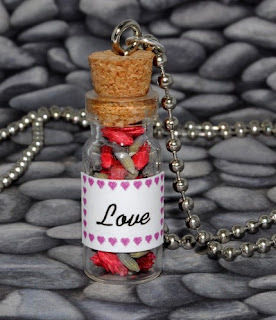 My favorite necklace is the Love Spell Vial Necklace, but I think they are all adorable. my favorite item is the Set of 10 Mix and Match Bangles - Very Variegated To The MAX!! So colorful! I really like the Chocolate Brown Adjustable Ribbon Necklace with Orange and White Swirl Bead.